The First Transcontinental Railroad – An image you wouldn’t expect? The final section of the First Transcontinental Railroad was built between 1863 and 1869, and allowed the whole of the continental USA to be crossed by rail. It connected San Francisco with the rest of the US rail network via the town of Council Bluffs, Iowa. Today we look at a few images of this amazing feat of construction. 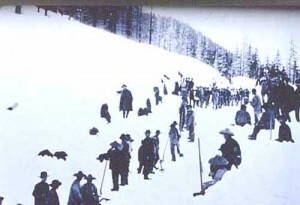 Firstly is a blurry image of Chinese workers constructing the railroad in the snow in the Sierra Nevada, California. In fact, Chinese workers played a major role in building many tunnels for the railroad. After years of hard work, and with the Civil War over, the railroad was finally complete by 1869. In this bright painting, we can see Leland Stanford, one of the owners of the Central Pacific Railroad, hammering the ‘Golden Spike’ in to the ground at Promontory Summit, Utah in May 1869. This painting is from the late 19th century.